Is Her Grass Greener Than My Grass? A friend of mine and I both grew grass for a party. I realized that her grass was different from mine. (pictured above) and I had grown rye grass (below). Did hers look better than mine? 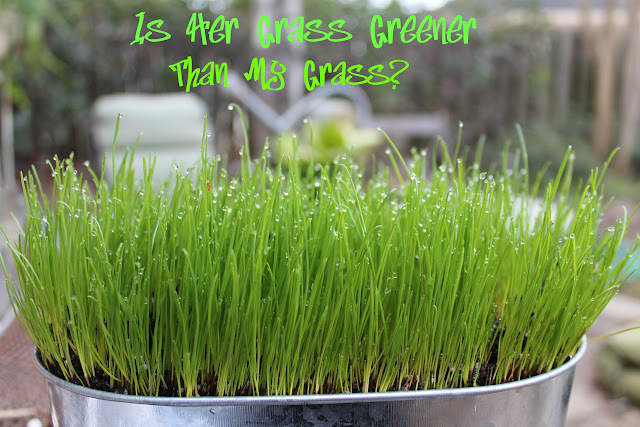 Did I wish I had grown wheat grass too? Was her grass the proverbial "greener" grass? 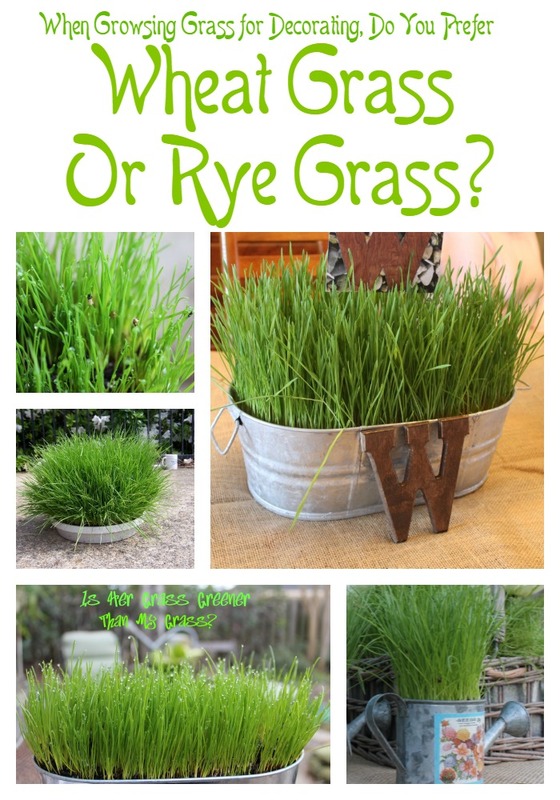 The wheat grass has a thicker blade than the rye grass. this time of year, they might have a preference. My rye grass also looks floppier than her wheat grass. I think that is primarily due to the age of the grass. was only two weeks old. thin layer of soil on top to help keep the seeds moist. The pots at the top of the photo do not have their top coat of soil yet. After a few more days, the tiny sprouts started coming up. They probably would have sprouted without the extra soil too. People do it both ways. be sure to not water the soil too much...it will "drown" the grass. I just love watching the new blades come through the soil. through the soil when the it starts to rise up like cake batter. Sometimes little clumps of dirt stick onto the blades. A few blades wear the tough outer portion of their seed like hats. at about two weeks old. This was probably their peak. weeks for it to grow...who knows? into the soil and affected the grass. A solution to floppy grass is to give it a "haircut". could show off their cuteness to more people. fence but it still has to be mowed. The first blog post I ever did was a tutorial about growing grass for decorations. I've got some seed started right now, have been spritzing it for 3 days. It's rye but now I'm thinking maybe i should have done wheat! Oh well, it's just for fun and I can try the wheat next time. Your close-up photos are so beautiful! P.S. I loved the floppy grass. Love your post! I have never grown grass like this but it looks so pretty I might give it a try soon! I LOVE this idea!!! My boys would love it and I know my cats would LOVE it! Thanx for coming to the party and sharing! We are going to have to try this out! Who knew grass could make me so happy? I just love the simplicity of your diplay, gorgeous!